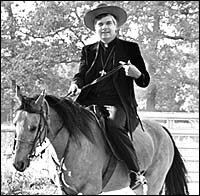 1931 Born in Torreon, Mexico, on Nov. 4, the son of an Air Force colonel of Catholic faith, who was stationed in Mexico, and a Presbyterian mother. He attends high school in St. Thomas, US Virgin Islands. 1953 Graduates from Harvard University. Starts studies for the priesthood at St. Joseph's Seminary in Louisiana and at the Pontifical College Josephinum in Columbus, Ohio. 1961 Ordained as a priest and sent to Natchez, Miss. He takes an activist role in support of civil rights, joining the Mississippi Leadership Conference and the Mississippi Human Relations Council. His views on civil rights expressed as editor of the Natchez-Jackson diocesan newspaper lead to threats on his life. 1968 Goes to Washington to serve as executive director of the National Conference of Catholic Bishops' Committee on Ecumenical and Interreligious Affairs. He becomes increasingly involved in Catholic relations with Protestants and Jews. Is active in writing the third draft of the bishops' pastoral on nuclear arms. 1984 Cardinal Humberto Medeiros, archbishop of Boston, dies Sept. 17, 1983. Four months later, Pope John Paul II appoints Law to lead the 2 million Roman Catholics in the Boston Archdiocese. 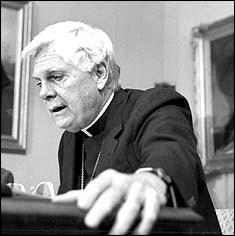 In 1984, Law joins Cardinal John O'Connor of New York in denouncing Democratic vice presidential candidate Geraldine Ferraro for her support of abortion rights. He splits with many other church leaders in proclaiming abortion the most crucial issue of the campaign. 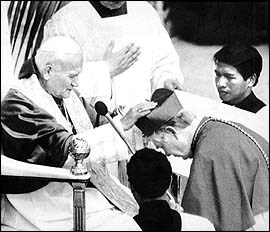 1985 Pope elevates Law to cardinal. As a member of the College of Cardinals (there are currently 13 American cardinals), Law is given a role in the governance of the Roman Catholic church, including a vote in the election of a new pope. 1986 Travels to a Nicaraguan prison to console Eugene Hasenfus, the American pilot arrested for smuggling weapons to the contras. He also leads a pilgrimage to Poland with both Catholic and Jewish participants, visiting Catholic shrines and Auschwitz, a former Nazi concentration camp during the Holocaust. 1989 At Law's behest, many of the 400 parishes of the archdiocese collect donations at Mass to aid victims of Hurricane Hugo in Puerto Rico and the Virgin Islands; makes a private trip to Cuba. 1990 Makes an official visit to Cuba , meeting with Fidel Castro for more than two hours. Dedicates the Seton Manor hospice on the campus of St. John of God Hospital in Brighton; its 24 beds are quickly filled with homeless people with AIDS. 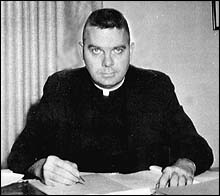 1992-93 Decries media coverage of accusations that James R. Porter molested between 50 and 100 children while serving as a priest from 1960 to 1967. Law describes Porter's alleged abuse as an aberrant act and declares he will answer no further questions about the case. Eventually announces new guidelines dealing with sexual abuse. 1995 Requests a moratorium on clinic protests after abortion opponent John C. Salvi shoots and kills two receptionists and wounds five other people at two women's health clinics in Brookline and Boston. Five months later, the ban is lifted. 1996 Joins 300 demonstrators in front of the White House to urge President Clinton to sign a bill that outlaws late-term abortions. 1998 Leads a delegation of 150 Boston-area Catholics � including four congressmen, 46 priests, and 5 nuns � to Cuba. Joins US Representative Joseph Moakley in announcing the departure of a US plane with 3,000 pounds of supplies bound for Honduras, ravaged by Hurricane Mitch. Calls for the closing of 40 to 60 of the 387 parishes in the Boston Archdiocese by 2008, in an effort to revive the church in an era of declining attendance and shrinking supply of clergy. 2000 As part of celebration of the jubilee year, Law publicly expresses sorrow for Boston Catholics' treatment of Jews, blacks, non-Catholic Christians, and alienated Catholics, and for the sexual misconduct of parish priests. 2001 Launches the largest diocesan fund-raising campaign in the history of the Catholic Church in the United States, seeking to raise $300 million. 2002 Faces mounting accusations that his leadership of the archdiocese covered up accusations of sexual misconduct by priests.